Candid Unheard Voice of Indian Microfinance: "HOW TO MANAGE POLITICAL RISK IN MICRO-FINANCE?" The dates for the proposed training workshop are JUNE 22nd, 23rd and 24th, 2016 and it will be held at New Delhi, India. Complete details on the training workshop will be released on March 10th 2016. Watch this space for more information! 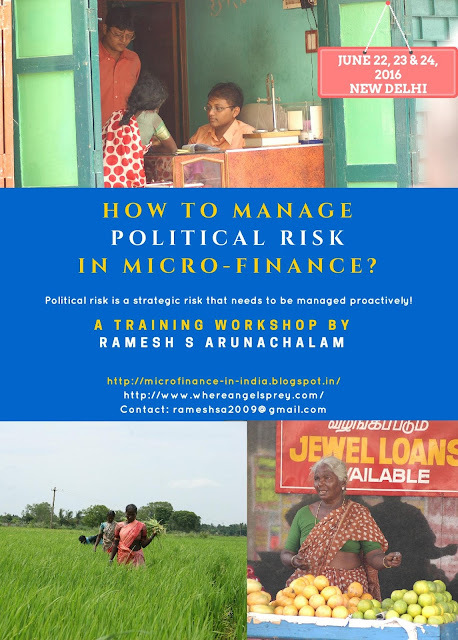 HOW TO MANAGE POLITICAL RISK IN MICROFINANCE? • Ramesh S Arunachalam, will be the facilitator and he has over 28 years of grass-roots and institutional experience in financial sector development including what is today called as microfinance and financial inclusion. • As on date, Ramesh has worked in about 570 districts of India and also travelled and worked extensively in about 29 countries in Asia, Africa, North America, Europe and the Caribbean across diverse projects (in senior positions). He is passionate about his work and brings strong inter-disciplinary insight to his assignments. • His clients include governments (Governments of India, St Lucia, Singapore, Malawi, Uganda, Philippines, Afghanistan etc, several State Governments in India and many GoI Institutions like NCRPB, SIDBI, NABARD etc), bi-lateral agencies (DFID, USAID, DANIDA, NORAD, SIDA etc), multi-lateral agencies (UNDP, World Bank, ADB, IFAD, The Commonwealth Secretariat etc), international NGOs (CARE, HIVOS etc), regulators, commercial banks, investment banks, microfinance institutions, private sector firms and several other stakeholders globally. • He has authored numerous reports/studies/papers as part of his assignments, several of which have been published internationally and received global recognition. His blog on microfinance has been very well received and he has also penned two books - The Journey of Indian Microfinance and An Idea Which Went Wrong: Commercial Microfinance in India – both of which, have received critical acclaim. His latest work is an entertaining crime thriller novel – Where Angels Prey – released globally in April 2015 through AuthorsUpFront and has been very well received by the market.